The newest film from prolific indie film maker Steven M. Smith (Haunted, Essex Boys: Law of Survival, I Am Hooligan, Borstal, The Howling, The Doll Master). 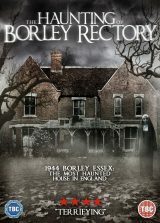 The Haunting of Borley Rectory is a supernatural horror based on the most haunted house in England. It is set during the end of the Second World War and centred around an injured vet who is sent to the countryside to do important war work. It’s 1944 and the Allied forces are taking the fight to the Germans. In Italy, the battle of Monte Cassino is taking place and G.I. Robert O’Neill (Zach Clifford, The Derelict: A Star Trek Fan Production (Short)) is separated from his squad when he is found by a German soldier. Meanwhile we see Marianne (Sonera Angel, Roofied: A Double Dose) and Harry Price (Rad Brown, Blood Feud) discuss past events at Borley Rectory and how Harry, an investigator, is now a believer in the paranormal and the Nun (Georgi Taylor Wills) who haunts the ruins of the Rectory that mysteriously burnt down just before the start of WWII. Somewhere in Southern England a man with a limp walks with a stick through a rural landscape towards a man leaning on a farm gate, awaiting Lieutenant Robert O’Neil. He is Mr Gibson (Garry Roost, EastEnders) the local gamekeeper and he owns the cottage that Robert will be billeted at, where he will work on the military owned property to listen to German radio signals and translate them. But he cannot do that all the time so he explores the local area and soon comes across the ruins of Borley Rectory and encounters the apparition of the Nun, who promptly follows him home and things start to get a bit creepy. The person that knows the most is Laura, the young woman who brings him his supplies, but she is very reluctant to talk about the things she has seen. Can Robert discover the truth of the ruins of Borley Rectory? You can pre-order your DVD copy now.